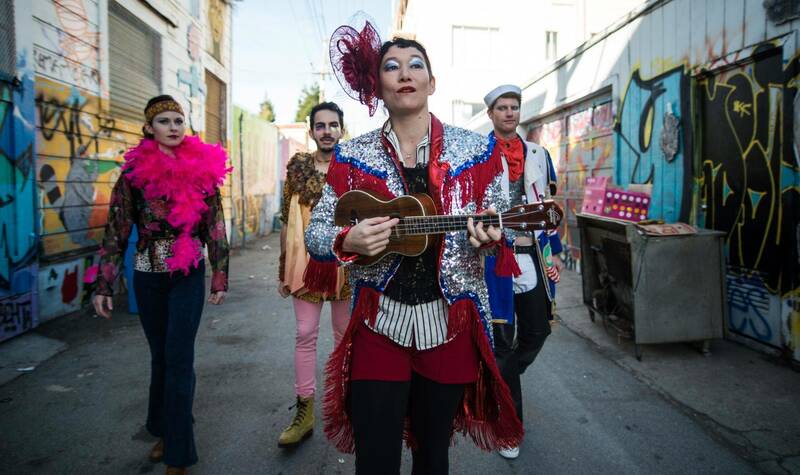 I knew I had to join the aptly named Detour Dance on their new dance odyssey around the Mission when the company proposed a dress code: "your most fabulous, glittery, flowery self (with comfortable shoes, of course)." Yes, there is a lot of walking involved in the experience, titled Fugue. And when the tour guide (or self-styled “path-finder”) arrives clad in red shorts, sequined tailcoat, a fascinator worthy of Ascot, and glittery eye makeup, it’s impossible for one to be overdressed. 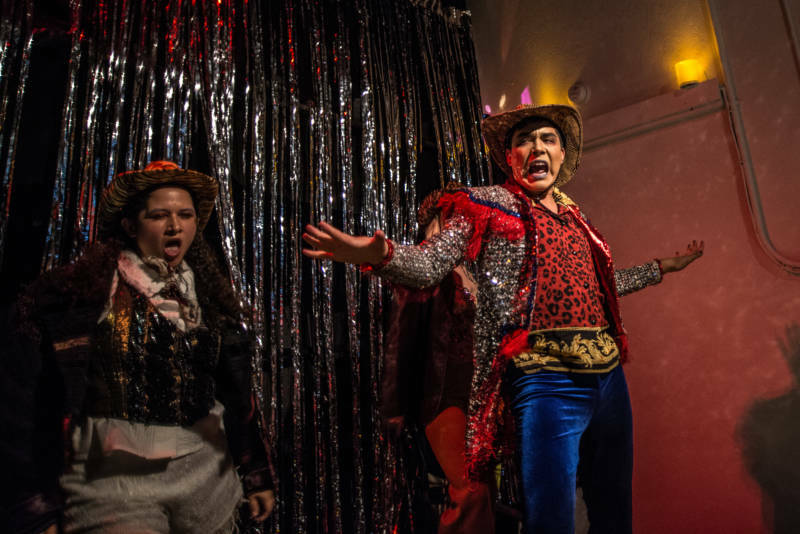 The crisp, weed-scented night air on Dec. 1 made it a perfect opening night for a madcap dash around the Calle 24 corridor. 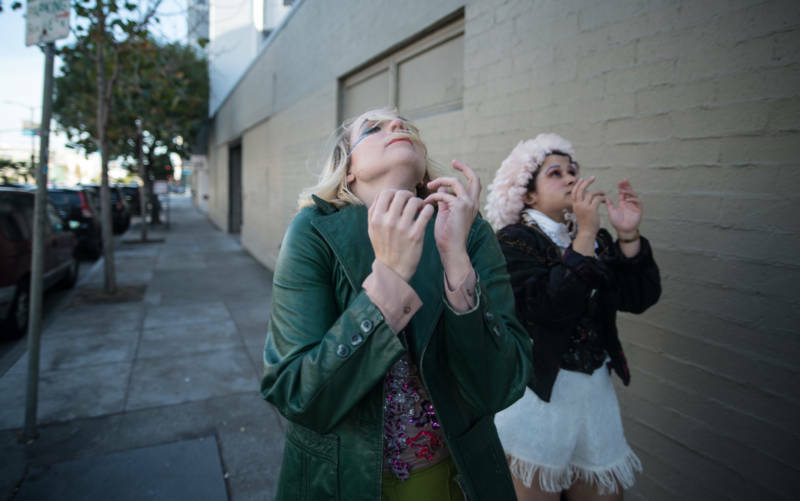 Fugue is more than a madcap dash, though — it weaves historical narratives about queer people of color in the Mission into poetry and site-specific performance art. Detour founders Kat Cole and Eric Garcia inject elements of fantasy into this profoundly ambitious enterprise with an overriding social-justice theme. On Friday, night, after streaming out of the jewel-box-like Holy Innocents’ Episcopal Church, the audience broke up into small groups, each instructed to take a different route to meet their guide. On our way, we ran into a pair of angels in wigs and fairy lights. They cavorted along the sidewalk, pausing to press an ear to garage doors along Fair Oaks Street, as if listening for mysterious messages from on high, piped through the HVAC of the elegant row houses. Quiet blocks lined with immaculately restored painted ladies, spruced up for Christmas, quickly gave way to assorted commercial establishments and more modest houses whose main window ornaments were stickers proclaiming solidarity with Black Lives Matter and LGBTQ rights. We hooked up with our guide, who introduced herself as Frank (short for H.R.H. Francesca) — but whom some of us recognized as the formidable Erin Mei-Ling Stuart – outside the storied Revolution Café. Frank promised to lead us to a fabled “new city,” evoking Peter Pan as she darted through the busy streets. A light canister dangled from her backpack in place of Tinkerbell on her shoulder. We made pitstops along the way to contemplate the haunts of former inhabitants whose stories were unearthed during two years of research by Cole and Garcia. These stories were fashioned into a script by playwrights Lourdes Figueroa, Baruch Porras-Hernandez and Brian Thorstenson. From this emerged Frank’s poetic monologue of bite-sized tales that underscore the crazy quilt of democracy and greed that blankets the Mission, the oldest settlement on the Bay, which long sought to remain distinct from the rest of San Francisco. Even through the Gold Rush, and the waves of immigration by the Irish, Germans, Scandinavians, Mexicans, Central and South Americans — who were often fleeing deprivation or political unrest in their homelands — Mission residents fought for self-governance. But among the new condos in the Mission, there is still much exhilarating diversity to take in, from Radio Habana to the Free Speech Wall, and all manner of spiritual practice. As we wound down the first portion of our journey, Frank reflected, “You have to leave when the city stops sending you secret messages to stay.” She pulled a ukulele from her backpack and, for the remaining few blocks, serenaded us with a whimsical ballad. Could there be any better way to navigate the Mission, I wondered, as we traipsed past the Salvation Army, its dusty windows seemingly frozen in time at Christmas in 1972? The second half of the program took place in the round at a studio in the Old Sears Building (a.k.a. the portal to the “new city”). 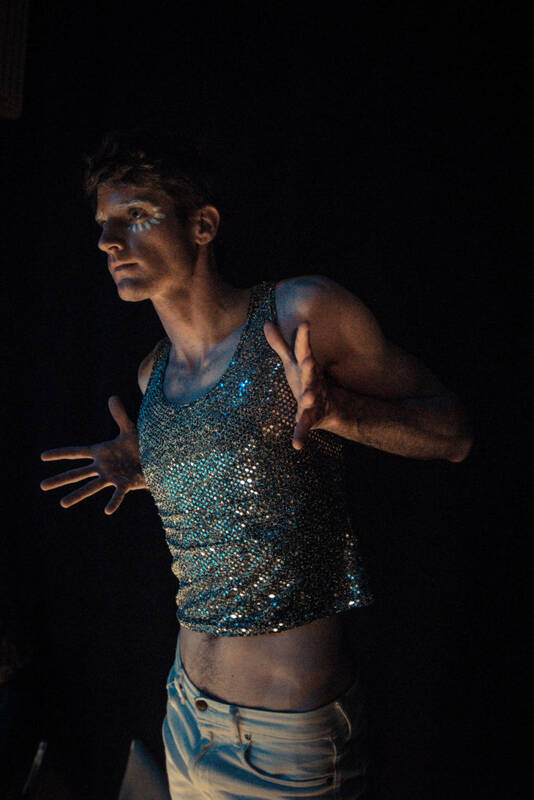 This series of ensemble dances, solos and duets by the striking company of 10, possibly meant to evoke a utopian setting, felt to me more like the labors of a community stranded on an alien planet, hopeful of rescue. There was much gesturing skyward, intricate tracing of celestial flight patterns on invisible sand, and scrambling to various heights (on chairs; up stairs) to scout for friendly rocketships. In the most spellbinding sequence, Scott Marlowe and Arletta Anderson ascended a staircase, absurdly entwined, both supporting each other and weighing each other down. The terrific soundtrack, with original music composed and recorded by Brent Arnold and further engineered by Teddy Hulsker, included the scraping of an otherworldly cello, what sounded like an Indonesian angklung orchestra, and a track from the Village People – unintentionally embellished by the sound of intermittent sirens from police cars racing down Cesar Chavez. The closing sequence, a live a cappella chant that resonated eerily through the intimate space, proved haunting. Crammed with gorgeous moments (and one very funny interlude), this part of the experience carried no echo of an arc from our earlier trek through the Mission. Perhaps there wasn’t meant to be one; after all, we were supposed to have left San Francisco behind to enter a new city. But it felt sad to leave even the ghosts of the Mission behind. 'Fugue' runs for five more performances from Dec. 8–10. More information here. If sold out, wait list for tickets is here.